How is personality correlated with preference for sweet or bitter foods? What genres of music best enhance the taste of red wine? 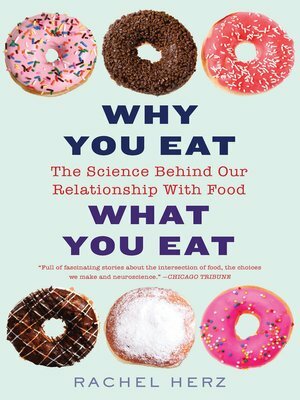 With clear and compelling explanations of the latest research, Rachel Herz explores these questions and more in this lively book. Why You Eat What You Eat untangles the sensory, psychological, and physiological factors behind our eating habits, pointing us to a happier and healthier way of engaging with our meals. Rachel Herz is a neuroscientist specializing in perception and emotion. She teaches at Brown University and Boston College, and is a professional consultant. The author of The Scent of Desire and That's Disgusting, she lives in Rhode Island.